Sloppy Joes are a nostalgic family favorite, and this homemade version kicks the canned stuff to the curb! Filled with ground beef that’s smothered in a zesty sauce, this easy 30-minute meal is perfect to make on busy weeknights. Remember being a kid and chowing down on those meaty, drippy Sloppy Joes? Well, these aren’t the ones your mom used to make if she used the traditional method of dumping the sandwich filling out of a can! I used to love these as a kid, but I’m not sure why. Maybe my taste buds have matured, but something about eating meat out of a can just isn’t appetizing anymore! 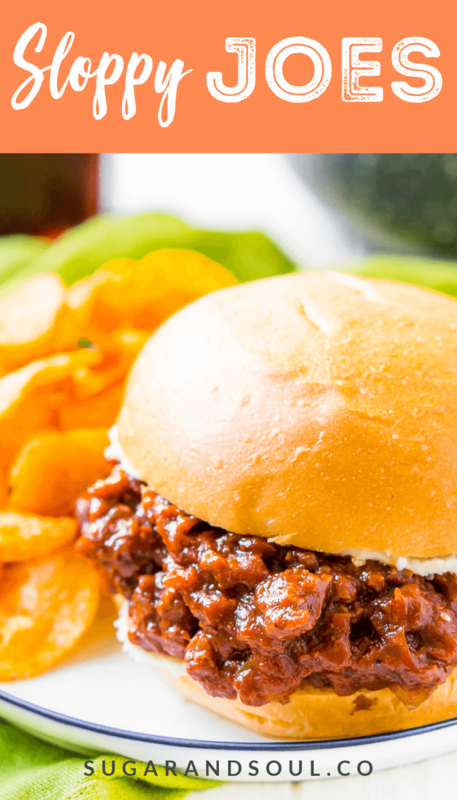 If you also have fond memories of mowing down on Sloppy Joes, you have to try this homemade version! Not only is it fun to walk down memory lane, it’s a creative way to use ground beef if you’re tired of burgers or meatloaf. JUST TAKE ME TO THE SLOPPY JOES RECIPE ALREADY! 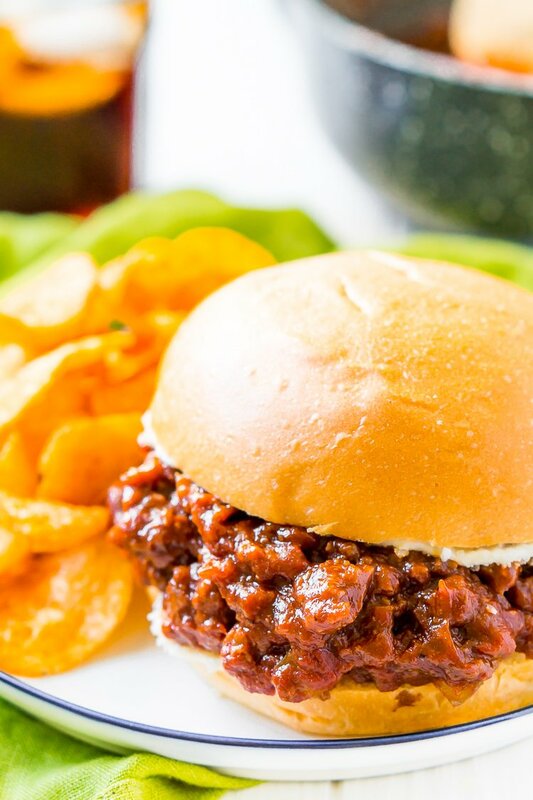 If you’d rather skip my (very helpful, I think) tips and tricks, essential cooking info, and similar recipe ideas – and get straight to this deliciously easy Best Ever SLOPPY JOES Recipe – simply scroll to the bottom of the page where you can find the printable recipe card. It’s believed that the sandwich originated at Floyd Angell’s café in Sioux City, Iowa in 1930 when a cook named Joe added tomato sauce to his “loose meat” sandwiches and the “sloppy joe” sandwich was born. What are the Ingredients to Sloppy Joe sauce? The sauce in this Sloppy Joe recipe calls for diced onion and green pepper, and a savory mix of garlic powder, Dijon mustard, ketchup, and tomato paste. Worcestershire sauce and apple cider vinegar lend a little zing, and barbecue sauce plus a pinch of light brown sugar balance it all out with a subtle sweetness. 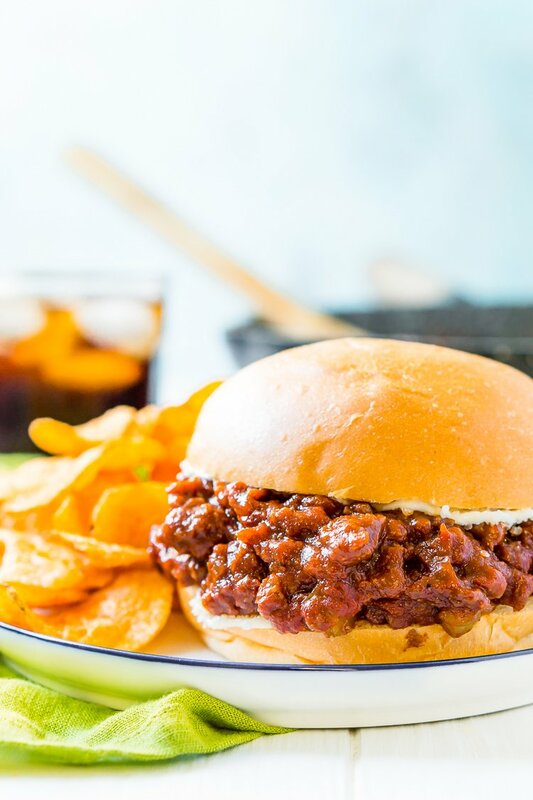 I love this Sloppy Joes recipe because it’s healthier and way tastier than the stuff I grew up on, but it’s still nostalgic and brings back good memories from my childhood. And let’s just say, when Evie is old enough to chew, she’ll be eating these scratch-made Sloppy Joes instead of the store-bought ones! 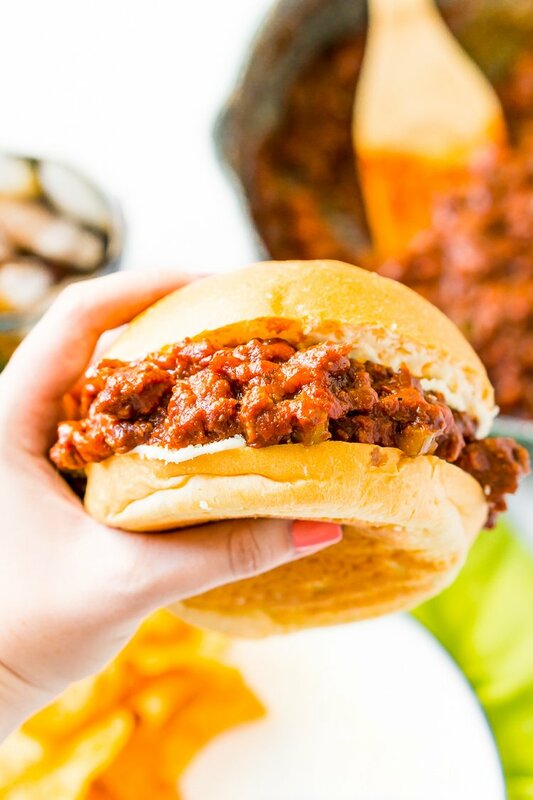 Whether you’re looking for a crowd-pleasing 30-minute meal to make on weeknights or you want to try a healthier version of the stuff you loved as a kid, these homemade Sloppy Joes are an upgrade from the saucy sandwiches we grew up on! Even without the canned stuff, this Sloppy Joe Recipe is really easy to make. You’ll begin with a large skillet where you’ll brown your beef, onion, and green pepper. Once cooked, you’ll want to drain off the liquid/fat. Some people like their Sloppy Joes extra sloppy, feel free to add extra ketchup or barbecue sauce if you find the mixture if too thick for your liking. Once everything is cooked, put a heaping scoop of the saucy beef on a bulky roll, and dinner is served! You can even add some veggies like avocado, tomato, and lettuce, and serve it with a salad, steamed veggies, or some creamy mac and cheese! 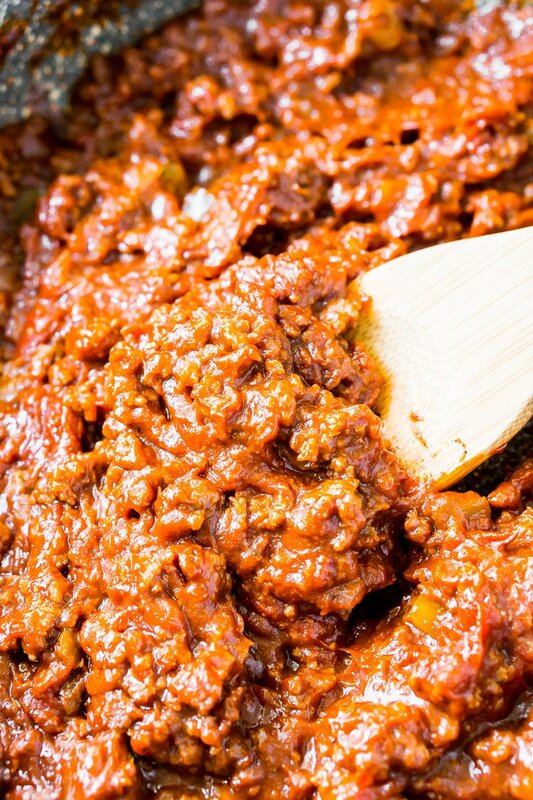 Pin this Sloppy Joes Recipe for Later! Add the ground beef, onions, and green pepper to a large skillet and cook over medium-high heat until beef has browned and vegetables are tender. Drain excess liquid. Add in the remaining ingredients and simmer over medium-low heat for 15 to 20 minutes until sauce has thickened. Serve the sloppy joe mixture on hamburger rolls. I like to spread a little mayo on my rolls and sprinkles my sloppy joe mixture with grated Parmesan cheese for extra flavor. Nutritional information is an estimate and does not include hamburger rolls or any additional condiments or toppings beyond the ingredient list. Sometimes nothing seems to satisfy like a good sloppy joe sandwich. You’ve made me very, very hungry with this recipe. Now I need to make sloppy joes! I loved sloppy joes as a kid, so I had to make these as soon as I saw them, we had them for dinner yesterday and everybody loved them. I forewent the bell peppers & dijon mustard as we didn’t have any and used 6oz tomato paste instead of half and ketchup, but they turned out really delicious! I’m so glad you enjoyed the recipe, Veronica!